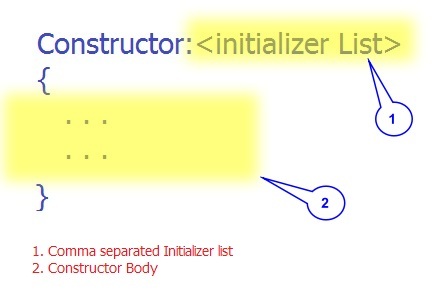 In this hub, I will explain what is "Constructor Initializer List" ? The initializer lists are useful to initialize the data member of a class. Actually, the constructor does this initialization stuff inside the body right? Let us say a class is having a const data member in it. Where should we initialize it? Well. Let us explore this with an example. //			 with const member with it. cout << "Salary = " << m_Emp1Salary << ", Bonus = "
cout << "Salary = " << m_Emp2Salary << ", Bonus = "
cout << "Salary = " << m_Emp3Salary << ", Bonus = "
Look at the below two statement. We have two CEmployees objects Welding_Emps and Lathe_Emps. But, these objects while creating binds to different bonus percentage 10 and 5 respectively. The important thing about this is that constant objects cannot be changed after the binding is done. In our case, Welding_Emps have bonus percentage of 10 and Lathe Workers have the bonus percentage of 5. This example also uses the constructor initializer list and it is required as we have a constant member to hold the bonus percentage. 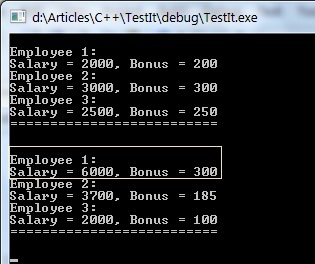 In the output, you can see that the salary for the employee one is changed. But bonus percent cannot be changed from 5 percent for Lathe_Emps and 10 for Welding_Emps. So, again, the order is based on the Layout of the class template and the order in which the initializer list is formed. It will be best practice to maintain the same order in the class layout as well as initializer list as well. This will help a user to know about the initialization order without looking the class layout. You saw that a constructor initializer list is useful to assign a value to the const data member. Then with an example, we saw how do we have different objects of the same class type having a different constant value. Finally, this hub showed you the order of initializer list does nothing but the layout of the class will. You should note that the Constructor initializer list is useful to bind the reference data member as well. Did you ever confused with the Initializer List order (when the order is different from the class Layout)?